It has been a long while since I've last played with Lubuntu. My Ocelot review was not very favorable. While LXDE did kind of work, it failed to impress me. It also failed to cause the disruptive change, either by dislodging the big, supposedly heavy desktop environments like Unity and Gnome 3, or by stopping the development of rebellious successors. Naturally, it comes down to the desktop setup, because Ubuntu is Ubuntu. As we've seen not that long back, LXQt came to replace it, but then it did not. LXDE lives on, and it graces a bunch of desktops. Then again, Lubuntu does not seem to work as expected, because there's LXLE Linux building upon its flaws, making them less. Indeed, today, we shall see how well Lubuntu Utopic stacks against the original version, as well as LXLE. 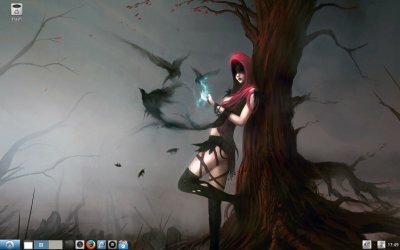 And in general, we must not forget the crucial existential question of necessity for lightweight desktops, given the presence of the likes of Xfce and MATE, both adorning Ubuntu. Follow me please. 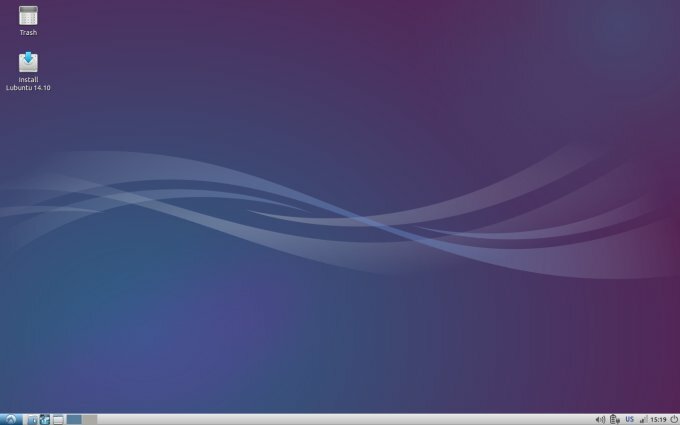 Much like LXLE, Lubuntu offers a fairly bland desktop to users seeing it for the first time in the live session. It works, but it's not impressive. Xubuntu and Ubuntu MATE do this much better. More elegance, more style, but not necessarily more CPU and memory hunger. It works, but it ain't pretty or composed. Just look at the popup notifications, with the gradiented 24px stripe. Horrible. 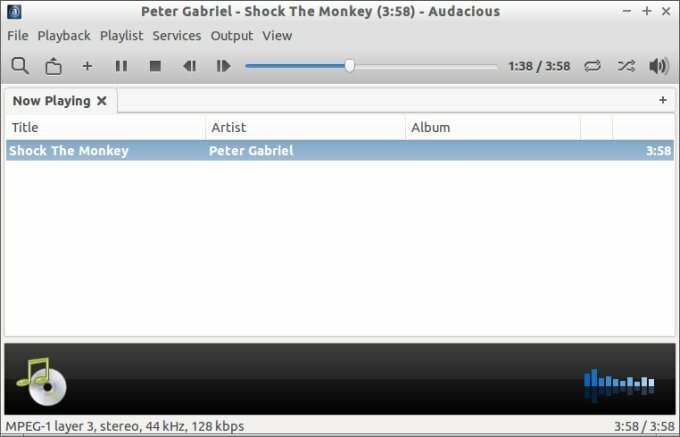 The panel comes with icons of different sizes, and the blue theme is not very inspiring. The system area also does not feel inviting and modern. You cannot place new shortcuts and icons using drag & drop. You must setup an application launcher and then manually add items, then move them up and down until they fit, to your liking, sort of. Panel resizing comes with the same jarring visual issues like LXLE. Here, it's even slightly worse, because there's no screenshot utility, would you believe it. Well, most of the stuff worked. Wireless, in the 2.4GHz and 5GHz bands, Samba sharing. But printing to Samba shares did not. 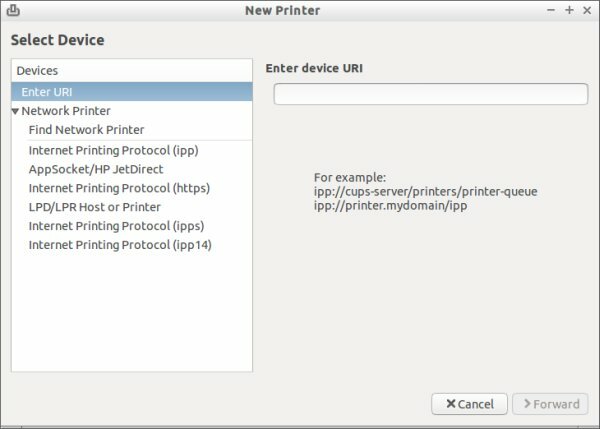 The option isn't even there, even though there are no less than three ipp options, and they aren't sorted in any cool way. Ugh. Youtube played, but without Flash. Understandable. 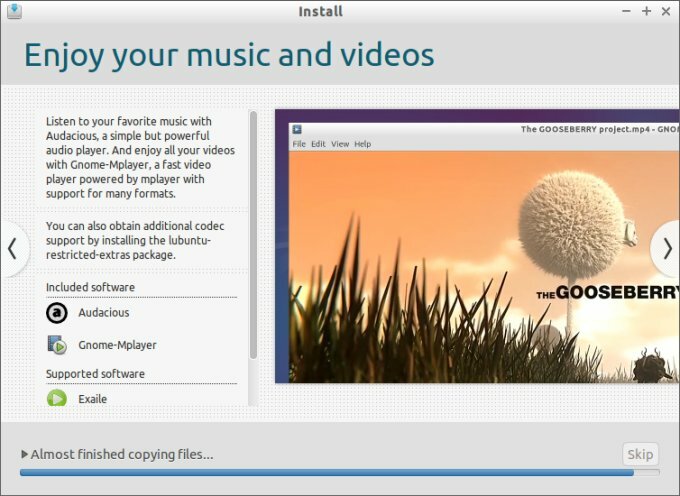 But then, you get MP3 codecs, which does not make sense, if the distro is supposedly following a restrictive licensing mantra for third-party plugins and whatnot. And then, you are also offered the chance to install those very same codecs during the installation. Why, I wonder, if they have already been supplied. Well, there isn't much to say. 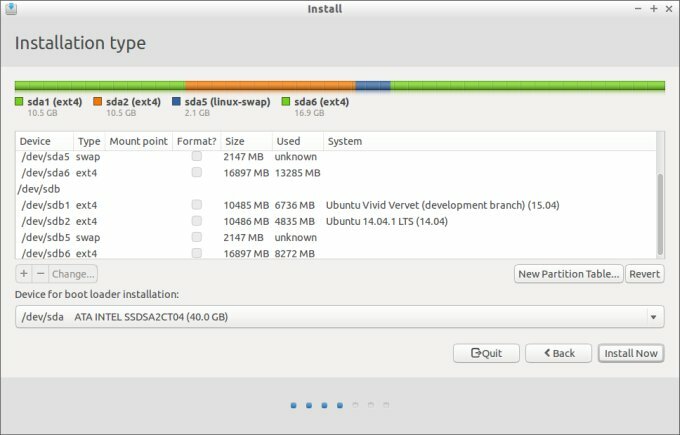 Like LXLE, Lubuntu offers the well-tested Ubuntu procedure. But you do get a nice slideshow, which is missing from the successor. Moreover, the installer is ultra-turbo-fast. The installation was really quick. I spent the first fifteen minutes tweaking the distro to my liking. Window decorations, icons, panel size and transparency, icon launchers, and whatnot. It was a long and frustrating experience that took me back to the dark days of the early 21st century. I must admit I did not really enjoy it, especially not after all the fun I've had with Plasma, or even Xubuntu Utopic. However, while Xfce has grown and flourished, LXDE remains the same. The default set still remains modest. Functional and useful, but not exactly mainstream. Most people will probably spend time installing new stuff. 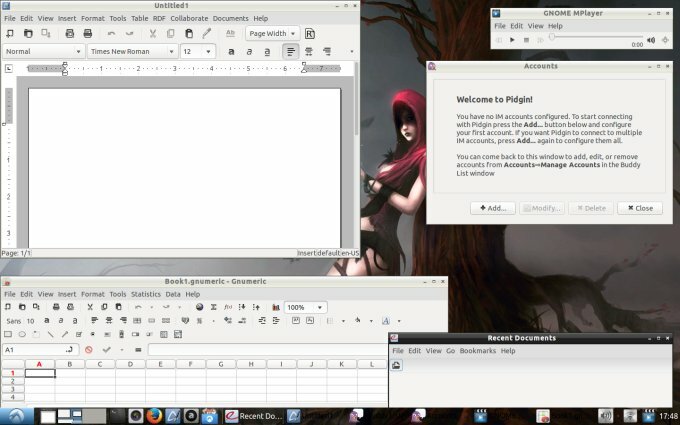 You get Firefox, Gnumeric, Abiword, Pidgin, and a few other programs. Okay, I guess. This seems to be one of the strong arguments for Lubuntu. Indeed, it's a blessedly quiet distro. The CPU stays put round 0%. One of the most peaceful ones I've ever seen. Truly, there's nothing bad to say. And memory usage is around 300MB, almost identical to Xubuntu. Now, the overall system responsiveness is the same. So basically, from the pure performance perspective, the two desktop environments, on this particular hardware, only differ by maybe 1% of CPU utilization. On the other hand, there's a vast gap in overall usability, in favor of the Xfce version. I simply can't find love for this desktop. Really. 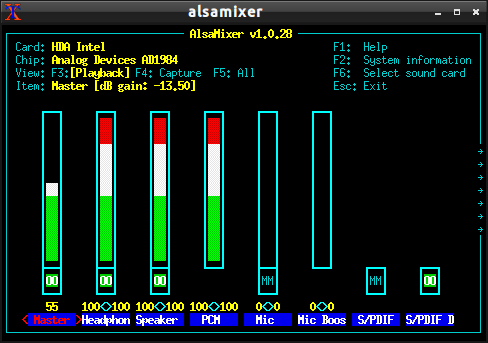 Just take a look at the volume mixer. It's an ncurses interface in a shell. Seriously. We're past that. No. I don't want to be enjoying my desktop this way. You don't even get a menu search. There's nothing functionally wrong with Lubuntu. It's not bad. It's simply not interesting. It's meat without flavor, it's a hybrid car, it's accounting lessons at the local evening school, it's morning news, it's a visit to Pompei while blindfolded. There's no excitement. You need a lean distro? Fine. Xubuntu. Problem solved. It's that simple. 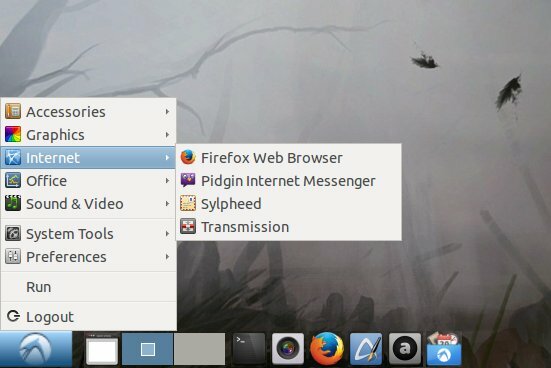 LXLE does offer some small advantages over this distro, but not by a great margin. Maybe there's a limit to how fun LXDE can really be. Alive does not mean lively. I liked this desktop environment in the past, but it's stagnated. It hasn't evolved at all, and its competitors have left it far behind. And that reflects poorly on Lubuntu, which, despite a calm and stable record of spartan behavior, has left with me an absolute zero of emotional attachment toward it. That's not good. It's 6/10 not good. Now, almost four years since my last Lubuntu review, that's quite bad actually. Overall, you shouldn't pass on this distro, and perhaps Utopic + LXDE is the perfect match for your aging hardware. But in most cases, you can happily replace it with Xubuntu, and everything will be just as fine, only far more fun. And that brings us to the end of this review. Fire away thy angry emails.